New LEDs -- light-emitting diodes -- can do more than save energy and slash electric bills. They can help drivers find an open parking space, deliver personalized coupons to shoppers' cellphones, stream movies and call 911 for an elderly person who has fallen in the shower. New lighting technology can include embedded control systems capable of gathering and analyzing data and responding to that information to improve everyday life "just like the Google car has sensors that can drive -- and some would argue drive better than people," said Bob Karlicek, who directs the Smart Lighting Engineering Research Center at Rensselaer Polytechnic Institute. At the core of that LED technology is a solid-state semiconductor, which resembles a smartphone's minicomputer. An LED and its socket can connect sensors, cameras, microphones and speakers with wireless communication and a continuous source of electricity. They can also dim, brighten and change color depending on the time of day or task at hand. And they can follow commands instantly to send data or monitor activity. Odds are good that smart lights will be widely used in the near term because they are readily available -- unlike, say, plug-in electric vehicles, which are expensive and require infrastructure. And lighting manufacturers are going to do their best to make sure everybody knows about their wonder products. It is a sure market, experts say, peddling LEDs to commercial and industrial users. 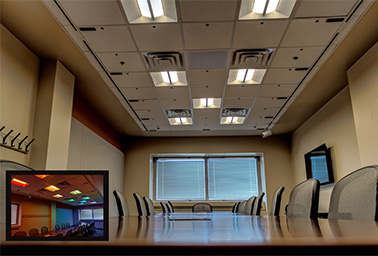 LED lighting can improve the productivity of a meeting --or create a dance party--by instantly changing to any one of a rainbow of colors with a smart phone application. Photo courtesy of the Smart Lighting Engineering Research Center. "LED prices have declined far enough that this type of lighting is now the economical choice for almost every setting and use, and heavy attention is being paid to the ongoing energy savings the technology offers," a Navigant report on the smart lighting industry said in September. Global revenue from LED lamps and modules is expected to total $216 billion in the next decade, according to the report. Residential customers are a harder sell. Although the rapid drop in LED prices -- now lower than $9 a light on average, with a 15-month payback through energy savings -- is boosting sales, most home users are still replacing one burned-out bulb at a time. So lighting companies and information technology companies are turning to smart lighting to spur LED purchases and looking for revenue from added features and services for future profit. They want to make light an integral part of the "Internet of things"-- inanimate objects like light bulbs, washing machines and cars that can communicate with each other and automatically perform actions based on data to boost energy efficiency and ease daily life. "Once you implement LEDs, the question is, 'OK, how else do I save more energy?' I think that is why we are so interested in controls," said Tom Boyle, GE Lighting's chief innovation leader. Controls aren't new, he said; California has required control systems in buildings for several years, and many places have adopted sensors that turn off lights when no one is in the room. But those systems can be greatly improved, he said. "When you start to add wireless technology into LED products, whether it be refrigeration, indoors, outdoors or for the consumer, it is kind of the next level of energy savings." Plus, a light bulb provides a much lower price point as a data hub versus a $200 thermostat, Boyle said. 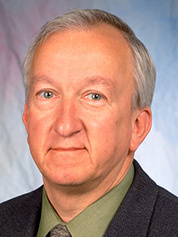 Bob Karlicek, director of the Smart Lighting Engineering Research Center at Rensselaer Polytechnic Institute, is working on lights “that can think.” Photo courtesy of the Smart Lighting Engineering Research Center. But it will be tough to place lighting front and center in people's minds and having them pay big bucks for a lighting system -- compared to a sound system or a new smartphone (let alone upgrade it every two years) -- could be a significant challenge. "As a lighting person, the one thing you know is that it is one of the last things people notice," Karlicek said. Changing the light can make a room look completely different, but people think first about paint colors or furniture, he said. "People are very, very used to bad lighting," Karlicek said. Making lighting as "addictive as a smartphone ... is a tall order." For now, energy efficiency is still the big win with LEDs. And the new sensors and features shouldn't cut too much into those savings, according to Frank Sharp, a senior technical leader at the Electric Power Research Institute. EPRI and utilities are keeping a close eye on the lighting sector, including how it can help programs aimed at lowering energy consumption in times of peak demand, as well as overall consumption, Sharp said. LEDs can slightly dim without being visibly obvious, which can translate into megawatt savings when spread over many facilities. "As we develop other new functionalities, it is critical for those devices to have the energy efficiency play. If they don't need to be fully deployed, they should go into sleep mode," Sharp said. "No one worries about 1 watt before it is done 1 million times," he said. Street lights offer the first significant test for smart LEDs. General Electric Co., Cisco and other companies have recently announced partnerships with cities to invest millions of dollars to revamp street lights with additional capabilities to monitor not only when lights turn off and on but also parking, security and traffic control. Sensity Systems is a leader in this new field that focuses on lighting as a service beyond light -- what the company calls the "light sensory network." The network can alert officials if, say, a car is stuck on railroad tracks, inform a frustrated driver where the open parking spots are in a crowded mall lot, or make public announcements in emergencies. "The shift to LED because of the energy savings is so dramatic, it is happening so quickly, that it is an ideal transition while you are changing the light to try to create a sensory network out of it," said Joel Vincent, Sensity's senior director of product marketing. This summer, Sensity announced a joint venture with Cisco and other vendors to create a "Smart + Connected Network" in Kansas City, Mo., that includes smart lighting, digital kiosks, a development data portal and smart water innovation development. Adding sensors, cameras or even speakers makes the lighting system a little more expensive, but the business case for doing this, Vincent said, is the multiple applications that help several departments do their jobs better without having to put up separate systems -- each one susceptible to hacking and an added expense. Sensity, based in Sunnyvale, Calif., also partnered with Cisco for systems in Newark, N.J.; Adelaide, Australia; and Bangalore, India. GE has announced a similar smart lighting system pilot in San Diego and Jacksonville, Fla.
And lights are not just making life easier on the outside. There are already LED bulbs from GE, Philips, Osram, Cree and several startups that dim, brighten and change colors -- say, a sunrise for a prearranged wakeup call or a sunset at bedtime, all done with a smartphone application. Research shows that blue light suppresses the production of melatonin, the hormone that tells the body to sleep, and an LED can slowly change its hue to remove blue. Similarly, changing the light hues in hospitals may help speed healing times and in schools can improve the productivity of students, researchers have found. A Hamburg state study found one German school experienced a 35 percent improvement in reading speed with almost 45 percent fewer errors under various brightness and color settings and a 76 reduction of hyperactivity under a warm color light setting. Some LEDs are now also speakers and can play music, as offered by Sony and startup Astro, which connects to Apple AirPlay. Retail stores are also taking advantage of lighting to make displays look more appealing and eye-catching. Stores can mimic lighting of different settings in a dressing room to help customers understand what clothes will look like at work, outside or in a bar -- a perk for stores and malls who need to lure customers away from online ordering. LEDs send light in fast, short bursts undetected by the human eye, and Kalicek's team at the Smart Lighting Engineering Research Center has already used that capability to develop a kind of Morse code communication in retail stores. People with the smartphone application opt in to "listen" to the lighting system in the store and receive the signal patterns through the camera on their phones. Each lighting area has a different pattern. In a store, the pattern will identify where customers are and the app will steer them to a product they want or send a coupon for an item nearby. The technology was spun off into a company called ByteLight and was acquired by lighting giant Acuity Brands earlier this year. Intelligent light bulbs face the same privacy and security issues as any Internet-connected technology. Frank Sharp of the Electric Power Research Institute says lighting companies are customer-driven and likely to be stringent on cybersecurity -- even more so for information technology companies. And Sensity Systems' Joel Vincent said consolidating camera and information systems into a "light sensory network" makes it easier to secure and isolate the problem and shut the system down if necessary. Privacy is a top concern for Sensity, Vincent added. "We only keep as much data on the camera as is necessary," he said. Bottom line, he said, the company communicates only information needed for action. For example, he said, the camera sees a car stuck on the railroad tracks but just conveys the car's coordinates, not necessarily a picture of the car or its license plate number. Even with these assurances, experts say, some people are likely to find it creepy that lights are watching them. But the Smart Lighting Engineering Research Center's Bob Karlicek maintains future generations will likely be more comfortable with smart lights. "I am old enough to have seen drastic changes of the acceptance level of 'creepy factors' by younger people enjoying the conveniences they provide and not realizing what they are trading for it," he said. GE, Philips and several other companies are working on similar "visual light communications" technologies for the United States, Europe and other countries. But Kalicek's center is pushing the boundaries of lighting even further. The National Science Foundation "pays us to be much more advanced," he said. The goal, he said, is intelligent lighting systems "that can think," that can analyze data from the interaction of light and its environment and react to the situation without human management or interference. Sensors that can analyze changes in the light itself can lower blinds, detect the number of humans in a room and adjust the air conditioning or heating, or even improve how plants are grown indoors. For medical care, it can observe if someone has fallen in a room or "Grandma approaches the refrigerator five times in five minutes" -- indicating a visit to the doctor may be needed, Karlicek said. Some lights can already dim or brighten according to the amount of sun coming from windows, but that is a "very early and very simplistic version of what we are doing," Karlicek said. "There is a tremendous amount of data in the light," Karlicek said. "If you are sitting in a space that is illuminated, all that information in that space is detected in reflected illumination." "We are beginning to revisit all the human factor design considerations developed with plain old white light," he said. An added bonus: Light bouncing can detect objects and changes in the environment without any image identification. As with many new technologies, privacy is a serious concern for adding sensors and cameras to lights (see sidebar). The City of Light may soon demonstrate an even greater opportunity for LEDs. The Paris Metro is considering enabling its quarter-million new LED lights to be able to provide Internet service to commuters, according to the United Kingdom lighting magazine Lux. Light has the same capability to carry data as the radio waves used by Wi-Fi, although over a shorter distance. And there is significantly more bandwidth available for light waves than radio waves -- a looming specter on the horizon for wireless technology. Adding light waves to the radio waves and cell towers would significantly boost the capacity of data communication networks. A new company, pureLiFi Ltd., is already pushing this "light becomes data" technology. It was co-founded by Harald Haas, a professor at the University of Edinburgh in Scotland, whose 2011 TED talk and demonstration of LiFi has been viewed almost 1.7 million times. While mainstream LiFi is still probably more than a decade away -- challenges include controlling how much digitized light bounces around, Karlicek said -- it illuminates the significance light could have in the future of everyday life.